Laundry. First of all, I must say that Grant wanted me to call this post “Shout it out” (in reference to both the commercial laundry stain remover and the fact that I literally am letting people know what I think here.) It’s pretty funny, but I wasn’t sure the laundry reference was obvious enough. . . I imagine that laundry soap comes under basic hygiene for most people. You wanna be clean right? Us too. Before the Clean Bin Project, we already used biodegradable laundry soap. However, it does come in a plastic bag, so we thought we’d try some alternatives. So far, I only have a few to present, but we can check in again when we have done some more washing. 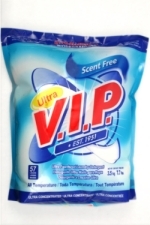 1) VIP Biodegradable laundry soap (made locally here in BC and actually very effective). I like it a lot: it doesn’t smell of perfume, and it’s available at regular supermarkets for regular prices. It also used to be bulk at the co-op, but sadly, no longer. 2) Homemade laundry soap. I used 1 bar of ivory (grated), 1 cup borax and 1cup washing soda (all packaged in paper products). Supposedly you only need a tablespoon per wash. We used more, and we still got “the towel smell”. If you don’t know what I’m talking about, you are a lucky person because the smell of towel that has been damp for too long is a horrible thing. Have you ever had your washer break before the spin cycle and then you left your wet load of laundry in there for about a week? I have, and I just have two words: towel smell. And towel smell is contagious, you can’t mix towel smell with non-towel smell. It is too powerful and will infect your whole load of laundry. So be warned. To be honest I accidentally used baking soda instead of washing soda in this recipe, plus I don’t really like the smell of ivory, so I’m willing to give this another go in the future with another soap base. 3) Sunlight “Eco” wash. This greenwashing is I ever heard of it, and the only reason we had it was that a house guest left it here, so we had to use it up. Not only is it a hard plastic container, it is shrink wrapped with thin plastic coloured to look like the earth. Clever marketing, boys. On the back in small letters it says “performs well under energy saving conditions like cold water washing”. That’s not eco, that’s cold water washing, and it has nothing to do with the laundry detergent. It did actually work ok, but that’s besides the point. It’s not biodegradable and it’s double wrapped in plastic. 4) Seventh Generation laundry powder in bulk. I honestly think seventh generation is hit or miss. Their products are expensive (even in bulk), but this soap is biodegradable and the first truly package free one we have tried. Everything smells fine. I’m not sure if my whites are all that white, but maybe that was leftover from the home-made incident. We’re still using this one, so I’ll have to review it fully in the next laundry installment. I tried as much as possible to use the clothesline this summer, but as we’re now into the rainy season, that is pretty much over. Our landlord did, however, buy an energy efficient washer and drier this past year, so we can dry our laundry with peace of mind. Now, what to do with those bits great wads of lint? So far, they’ve been piling up and are heading for the trash. . . .
the environmental store by my house has a sweet bulk section, including both powder and liquid biodegradable laundry soap, so i can just take in any container and fill it up! isn’t lint compostable? Oh, I forgot to add a word of caution. 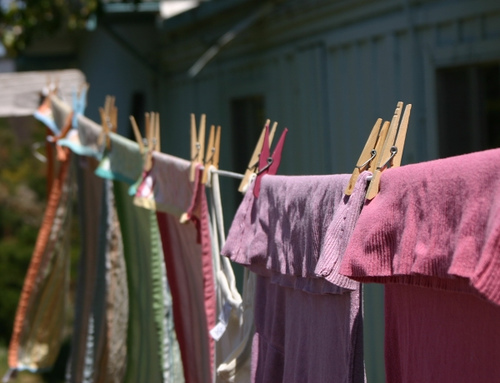 I line dry all of our clothes, too. Ended up waking up with a tick embedded in my side that was not there the night before. I think he was hiding in my PJ’s that had been drying on the line outside. Check your clothes for stowaways! Yes, we compost our lint too. But I just realized that my vacuum bag is getting awfully full! What do I do with the contents?? (The idea of putting it into my compost is really unappealing). I’m still not sold on the lint composing. What about all the polyester and other synthetic fabrics? I use homemade laundry soap with that exact recipe — but I always put in a half cup per load. I imagine you can vary it depending on your washer. I tried less and got the towel smell. Also, I read that you can use any bar soap, so I’m thinking of grating up some natural homemade bar soap for the next batch. Just some suggestions in case you decide to try again! Thanks for the hints Christine. I’m definitely going to try the homemade stuff again – good to know I’m no the only one who thought a TBSP wasn’t enough! I don’t know if you have a fireplace, but lint is a very good fire starter…. I use my dryer lint for fire starter as well. I don’t have a fireplace, but it goes in my backpack with my survival kit. We don’t accumulate too much since we use the clothesline in summer + also have a gullwing dryer rack for winter. I use a coat rack to hang up all of my socks and other small items inside. The rest goes on hangers or over the door to dry. I’m currently living in China, and it’s fairly polluted, so hanging my things outside to dry isn’t very appealing. Inside isn’t so bad. Curiously enough, I have yet to see a dryer here outside of a professional laundry place! The washing machine I have comes equipped with a spinner, and it gets most of the water out of my laundry.